Prints up to 5X16 ft that stay flat and rigid. Huge double-sided graphic panels. Backlit graphics face-mounted to sparkling clear acrylic. Roll-up graphics that ship right in your existing booth cases and lay flat and smooth when installed. Photographix offers complete finishing services including mounting, laminating, contour cutting and multi-panel mural assembly. We can produce graphics that fit your application, flat or rollable, using standard time-proven materials. To meet your creative needs, we can also produce unique solutions and design custom hardware. Available laminates include 3mil vinyl in gloss, semi-gloss, lustre, satin matte and matte. Heavier laminates include polyester and lexan in 10 and 15 mil. 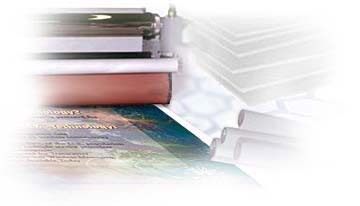 Standard substrates include JetMount, Gatorfoam, Sintra, and acrylic. Contour hand cutting and CNC routing is available in sizes up to 4X8 feet. We also install accessories such as velcro, grommets and other hardware.